EFL Championship referee Darren England visited Club Doncaster Sports College students this morning to offer some unique insight into life as a professional referee. The match official, who has refereed 48 Sky Bet Championship games, spoke with Year 13, BTEC Level 3 learners about his development into refereeing and the sacrifices involved in refereeing at an elite level. Along with questions surrounding their assignment topics, learners we offered a unique opportunity to pitch questions to Darren about all facets of life as a referee. In-depth discussions took place around VAR, dealing with teams and managers and issues around respect, whilst also looking into the values of working in harmony with a group of officials to produce the best officiating possible. BTEC L3 Sport Lecturer, Ben Thompson, commented: "We’re extremely grateful to Darren for taking the time out of his busy schedule to give our learners a unique insight into the world of an elite referee. 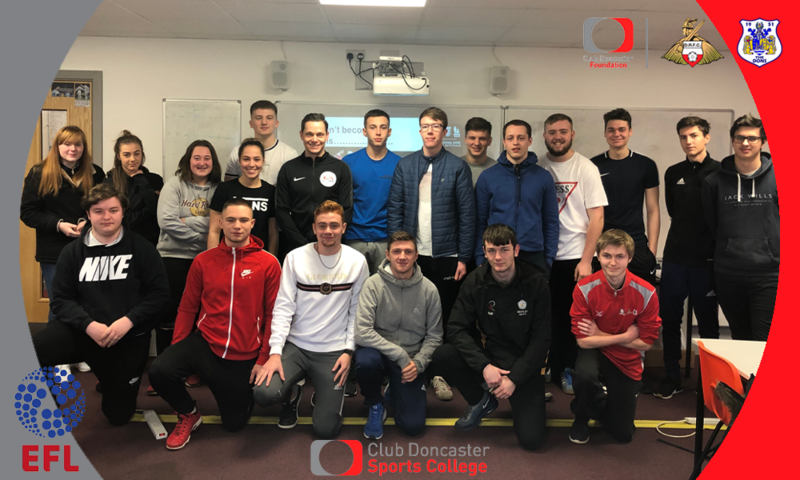 "As part of our commitment to learner enrichment, Club Doncaster Sports College strive to offer all of our learners real life experiences which will enhance their learning; Darren’s input is invaluable to the learner’s Unit 25 assignment on Rules, Regulations and Officiating in Sport." The Sports College Club open evening for 2019/20 will be held at the Keepmoat Stadium on Thursday January 24 4.30pm-6pm.